The beleaguered district needs any money it can get, but the new funds will not fill the hole of more than $100 million created by nonrecurring money in this year's spending plan. Superintendent William R. Hite Jr. was careful in his assessment of the governor's proposal, saying in a statement that he was "encouraged" by Corbett's call for more money. Mayor Nutter, who is attending a conference in South Africa, issued a statement applauding the governor's attempt "to respond to the enormous needs" of Philadelphia's schools, adding that he will carefully review the proposal. Others were not as measured. Jerry Jordan, president of the Philadelphia Federation of Teachers, said Corbett's proposal "falls far short of the funding needed to restore the student programs and services lost to previous budget cuts." Parents United for Public Education, in a statement, decried Corbett's proposal as a "paltry handout." "It's another year of parents scrambling for resources, paying for basic services in schools, and seeking charitable handouts to sustain even the best as well as the most basic of programs," the group said. 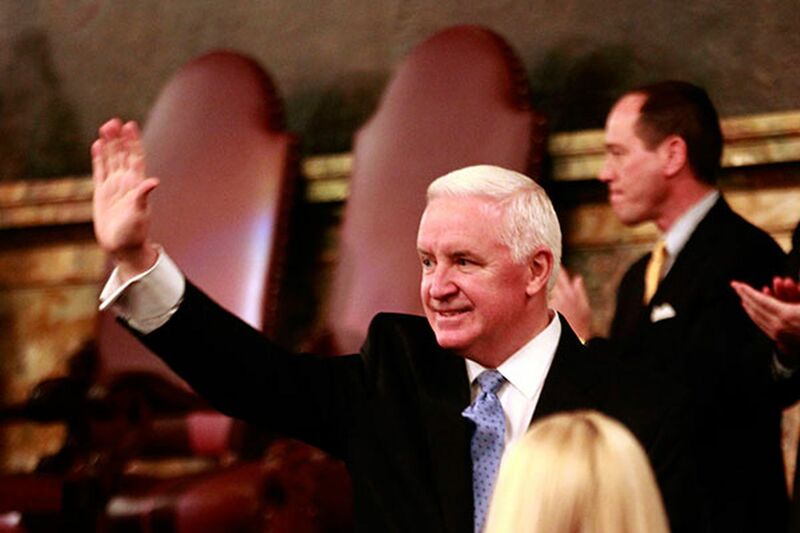 Susan Gobreski, executive director of Education Voters of Pennsylvania, said that Corbett's new education grants, including the $29 million for Philadelphia, was more than just a gesture. But, she said, Philadelphia's portion is inadequate, and the governor proposed adding no additional money to the basic education subsidy of $984 million, which represents the majority of the state's support of the district. "With no increase in basic education, we are going backward," Gobreski said, adding that the district's costs have gone up. "I'm very concerned about what this poses for Philadelphia." A few hours after the governor's budget address, the state Senate approved his two nominations to the School Reform Commission. By a vote of 44-2, the Senate confirmed the appointment of People's Emergency Center chief Farah Jimenez to a seat on the five-member panel and City Councilman Bill Green as SRC chairman. Sens. Vincent Hughes (D., Phila.) and Andrew Dinniman (D., Chester), who said there should have been public hearings on the nominees SRC, voted no. Hughes said the head of the Philadelphia delegation had requested hearings, as had education advocates. He said there were concerns about some of Green's statements, including one that the district should have two systems - one for schools that are doing well and another for those that are not. "That is separate and very unequal," Hughes said. Green has said that his views had evolved and that effective reforms could be achieved under the existing district structure. Senate Majority Leader Dominic Pileggi (R., Delaware), who chairs the Rules and Executive Nominations Committee, said hearings were not required for the nonpaying posts. He said his office received only one written comment about the SRC nominations even though The Inquirer had reported his committee was seeking public comments. "Obviously, it's not a matter of great public concern," Pileggi said. Mark Gleason, executive director of the Philadelphia School Partnership, said in a statement that Corbett had been "thoughtful and deliberate in selecting" Green and Jimenez. Nutter, who criticized Corbett's nomination of Green shortly after it was made known, said he believed Green and Jimenez "will give their fullest commitment to our children and their education, and I look forward to working with them." The new commissioners are expected to be sworn in before the next SRC voting meeting, set for Feb. 20.